As the 2014-2015 school year ends and we prepare for the next school year, AIP Foundation reflects on our results from programs targeting children’s road safety and helmet use. In Thailand, we saw 12,000 supporters pledge to wear helmets on motorcycles; in Cambodia across 18 project schools, average student helmet use rates increased from 0.4% in the pre-intervention observation to 85% in the second post-intervention observation. In Vietnam, policies for enforcement of child helmet use and a mass media campaign under the National Child Helmet Action Plan led to an increase in child helmet use from 38% in April 2014 to 68% in May 2015 across Vietnam’s three major cities. We look forward to advancing our commitment to reducing road crash fatalities and injuries even further during the next school year. Please read more about our activities and events during June below. On June 21, U.S. Ambassador to Vietnam Ted Osius wore an AIP Foundation Protec helmet while riding a bicycle in Hanoi as part of a campaign calling on people to protect the rhino. Have a relevant road safety photo? Tag AIP Foundation on Facebook or Twitter for a chance to have your photo featured! While attending the 3rd Memory International Film Heritage Festival in Myanmar, Global Road Safety Ambassador Michelle Yeoh was also promoting safer driving. During her visit, Ms. Yeoh distributed 100 of AIP Foundation's Protec motorcycle helmets free to local residents with support from Suu Foundation and FIA Foundation. Read more at Myanmar Times. A year-end meeting between AIP Foundation, local authorities, and four Helmets for Families project schools took place on May 21 in Tra Vinh Province and June 19 in Ho Chi Minh City. AIP Foundation presented the program’s achievements and facilitated discussions on challenges, lessons learned, and solutions for improvements. During the 2014-2015 school year and under the Helmets for Families program, 1,399 quality helmets were provided to parents of nine project schools at subsidized prices in exchange for their substandard helmets. AIP Foundation is collaborating with governmental stakeholders, civil service workers, and traffic police to exchange 2,587 more quality helmets to parents in the surrounding communities. Parents receive information about the importance of wearing quality helmets, the expiry of a quality helmet, and how to use a helmet correctly. From February to May 2015, through community-based helmet exchange activities, Helmets for Families trained 65 volunteers, directly reached more than 2,500 people, and indirectly reached 121,027 people. American businesses want to increase their investment in Vietnam, U.S. Assistant Secretary of State Rivkin said. Assistant Secretary of State for Economic and Business Affairs Rivkin was on his first-ever trip to Vietnam between May 26 and 30. On Wednesday, the official participated in the launch of a public-private partnership between the Department of State and AIP Foundation to support Helmets for Kids, an initiative through which partners are advancing the common goal of promoting essential and life-saving road safety education for children throughout Vietnam. To promote road safety awareness and serve as a positive visual reminder to students, Chevron and AIP Foundation will install road safety murals at schools in Phnom Penh. A launch was held late May to commence the program. Chevron will support the re-painting of school fences and the installment of murals at Wattanak Vichea and Phum 7 Primary Schools. More than six murals will be installed at each school, reflecting road safety, proper helmet use, and pedestrian safety messages. Images encouraging parents to pay special attention to their their children’s safety on the road and particularly to reinforcing proper helmet-wearing will also be included. Ninety police officers visited each of AIP Foundation’s 18 project schools under the “Head Safe. Helmet On.” project to speak to 4,381 students and 117 teachers about road safety for International Children’s Day. Traffic Police discussed proper pedestrian and road user safety, helmet use, and the importance of wearing a helmet. Under the context of International Children’s Day, June 1, 2015, AIP Foundation organized a second “Mothers and Helmet Use” forum at Anuk Wat Primary School. The forum is a component of the Helmets for Families project sponsored by Manulife. Mothers received information on their role in promoting road safety and encouraging helmet use among family members. Parents learned about the impacts of road crashes on society and their families, the relationship between helmet use and injury prevention, and received information about the new Road Traffic Law. Students also received this information at a police training on June 25, 2015. On June 19 and 26, volunteers reached the community surrounding the school to further spread road safety awareness. Factory workers earning just a few dollars a day have little choice but to pile into minivans or flatbed trucks often driven by unlicensed drivers on dangerous roads, every morning and night. A study released earlier this year by the Cambodian Ministry of Labor's National Social Security Fund reported 73 garment workers died in crashes during their commutes last year, a near 10% rise on the 67 killed in 2013. As part of the Street Wise project supported by Chevron, AIP Foundation organized a three-day training workshop for 18 teachers from primary schools in Songkhla. “Master Trainers” received training in road safety education in order to create a sustainable road safety culture at their schools. These trainers will train other Primary School teachers with the skills to confidently teach road safety education to their students, who will use educational materials developed during the workshop. This is the first road safety curriculum AIP Foundation is piloting in Thailand. The primary-level curriculum includes pedestrian, bicycle, bus, and motorcycle safety and was developed with the support of consultants Dr. Parichatt Krongkant and Ms. Linda Ivett, a road safety expert with more than 25 years of experience in road safety programs and teaching materials. On the second day of training, AIP Foundation, Chevron, and Wi Chian Chom School signed a Memorandum of Understanding. The five additional project schools from Singhanakhon District previously signed MoUs with Chevron and AIP Foundation in September 2014. Under The 7% Project, AIP Foundation and Save the Children in Thailand together trained 12 teachers on innovative new approaches to improve helmet wearing rates in schools. 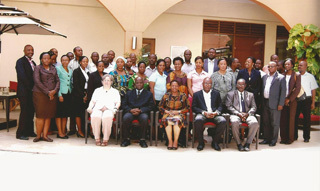 The training received positive feedback from teachers. AIP Foundation looks forward to rolling out interventions across six schools soon. AIP Foundation visited Prathom Taweetha Pisek School to introduce Helmets for Kids, supported by ARRB Group, to parents during a Parents’ Meeting. More than 200 parents participated and were asked for their support. Parents signed commitment letters in order to reinforce road safety among students. AIP Foundation received support from the Metropolitan Traffic Police Division to distribute Vespa helmets to Darakarm School along with the Office of Basic Education and Vespiario (Thailand) Co., Ltd. Special guests included Commander of the Metropolitan Traffic Police, Police Major General Apisit Muangkaseam, and Deputy Director of Office of Basic Education for the Metropolitan BKK. AIP Foundation strives to see enhanced enforcement of helmet use and higher child helmet use rates with support from officials. International and national road safety experts visited AIP Foundation in China to assist with Walk Wise Year 3 evaluations. Ms. Roopa Umesh is an expert in developing, implementing, and evaluating road safety behavior change programs; Dr. Baoguo Ding is an expert in road safety promotion and the Country Manager of Global Road Safety Partnership with responsibility in managing the Bloomberg Philanthropies-funded road safety projects; and Ms. Shuanghui Wu is a research assistant and graduate from the School of Sociology, Chinese University of Political Sciences and Law. AIP Foundation visited project schools, where these expert consultants organized parent focus groups, teacher focus groups, in-depth interviews, student knowledge tests, and student road safety behavior observations. As part of the 2015 Children Carnival held by Kai County Youth League and Kai County Children Palace, AIP Foundation led interactive road safety games on pedestrian and bus safety. Over 600 children and 400 parents attended the carnival with more than 300 children participating in the road safety games. Parents together with their children demonstrated how to use zebra crossings correctly and children learnt safe skills when riding on busses. Boda-bodas (or motorbike taxis) are a part of everyday life for many Africans. And in Uganda’s capital, Kampala, it is no different, with some estimates indicating well over 100,000 boda-bodas operating in the city. Launched in November 2014, SafeBoda connects customers with drivers that have been trained in road safety, customer service, motorbike maintenance, and first aid through a partnership with the Ugandan Red Cross. Drivers also provide passengers with road-worthy helmets. The Helmet Vaccine Initiative Tanzania took part in the second meeting of the Coordinating Committee of the Bloomberg Initiative Global Road Safety Project on May 21, 2015. The project aims to improve legislation and the media’s role in road safety.